Living in an era of big budget movie with producers ready to cash crores, it is quite interesting to know about a group of young movie lovers joining together for a project which stands unique. To be made with a budget of Rs 1 lakh, titled 'The Haunting - Oru Sathyanweshanam' will have the smallest cash and crew with 6 people in total. Touted as the lowest budget Indian full length movie, the crew is eagerly waiting for the authorities connected with Limca Book of Records aiming include the movie in it. With no music included in the movie, a realistic feel is added in every scene. This movie will be completed in 4 days in various locations using a 5D mark 3 camera. It is known that the first Malayalam movie J C Daniel's 'Vigathakumaran' which was shot in 1930 was made with a budget of 1 Lakh. 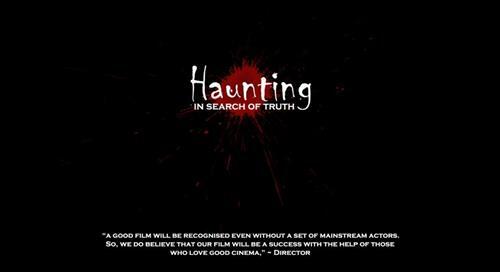 The Haunting - Oru Sathyanweshanam is a parapsychology thriller which would be shot at Thiruvananthapuram and Thrissur for a limited 4 days with three actors, two cameramen and a director. More interestingly the actors are using their own names in the movie. The story revolves around three Parapsychology students who are in research to prove the existence of ghosts. Parapsychology students Jisa Jose and her friends Vijeesh and Arun are on a research studying about the ghosts and psychic activities in Kerala. During their journey, the students have to encounter with some fearsome incidents which make this two-hour-long thriller much interesting to watch. The Haunting - Oru Sathyanweshanam is expected to be the first movie ever made which themes around the emotional and psychological aspects of fear. With no background or foreground music, real-time sounds would be added to keep the spectators on the edge. This is done to bring the original sounds to the scenes which will be a novel experience for the movie lovers in Kerala. Directed by Sudheep, who had worked with Jayaraj for a couple of movie is confident to complete the project as per planned. As the shoulder shots which are taken using the 5D mark III camera, it feels that the scenes are taken by one of the three actors in the movie. With a team of six cinema enthusiasts, it would be experimentation to enter the mainstream cinema. If 'The Haunting - Oru Sathyanweshanam' gets recognition, it would be a revolution in the making of films.